If you would like a Mission International speaker to come to you then please get in touch with us. Our speakers are able to come to your church, school or organisation to tell you about the work we do. If you have a special event and would like a speaker then all you have to do is get in touch via our Contact Us page. 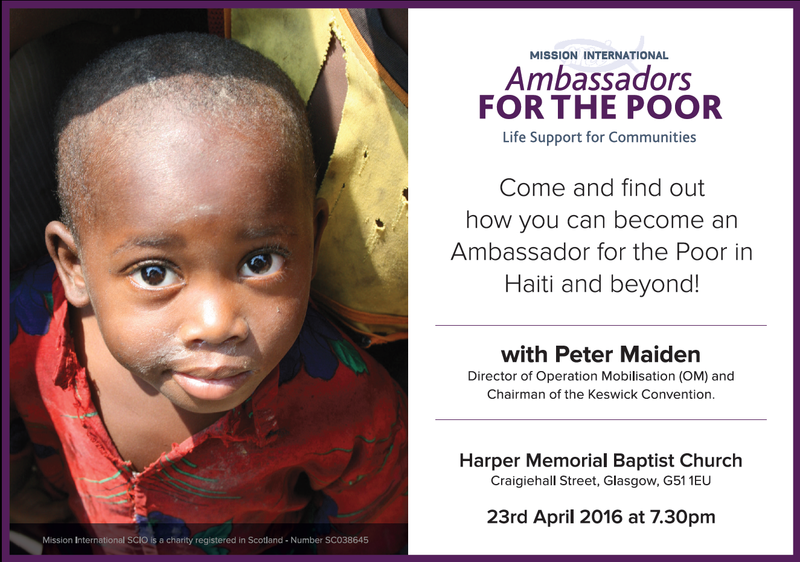 Mission International’s Haiti Project is being supported by the Church of Scotland Guild over a period of 3 years. Mission International speakers will be visiting around 300 Guilds across Scotland over that period. We visit many churches in every denomination and would be happy to visit your church too. Mission International is able to come to your organisation to inform and enthuse members about the work we do around the world. Whether it is a business group or a club we can tailor our talk to suit your needs. Global citizenship is an integral part of learning in schools and colleges nowadays. Our wide experience of serving in the developing world will bring insights to those who listen to stories from around the world. Click on image to enlarge! Help us change the lives of some of the world's poorest people.